The front page of The Wall Street Journal cited the difficulty of cities (Note 1) trying to stop the escalation of house prices “Western Cities Try, and Fail, To Slow Chinese Home Buying.” The more descriptive online headline said: Western Cities Want to Slow Flood of Chinese Home Buying. Nothing Works: Governments from Vancouver to Sydney to Toronto are using taxes and other restrictions to tackle real-estate bubbles. The article also covered Auckland and Melbourne and their attempts to discourage Chinese buyers, who have been getting much of the blame for the severe housing affordability. But “nothing works,” because not everything has been tried. A healthy market, whether housing or asparagus, has a balance between supply and demand. In each of these cities, the demand for houses far outstrips the supply. 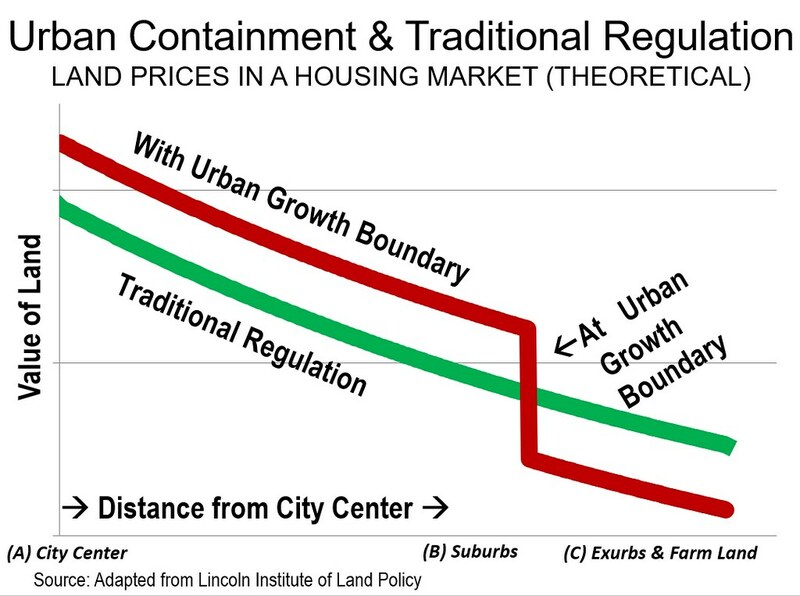 Yet, the cities have studiously avoided the obvious supply side policy that could restore housing affordability --- repeal of urban containment policy, and its destructive urban growth boundaries (UGBs). With their long standing UGBs, these cities occupy five of the 11 least unaffordable slots in the 14th Annual Demographia International Housing Affordability Survey, out of 92 major markets in nine nations. The cities have only themselves to blame. Their UGBs virtually forbid housing subdivisions to be built on inexpensive urban fringe land. The resulting scarcity drives up land values (and house prices), as gaps of 10 times or more per acre emerge between adjacent properties, depending on which side of the UGB they are on. Without the UGB, there would be little difference in value. Anyone who drives has experienced how supply limitations force prices up, from buying petrol (gasoline) over the last two decades. The fatal flaw of urban containment is it that it puts a tight lid on urban land supply, while demand marches steadily upward, like the pressure intensifies in a teapot if it is not allowed to vent.This hurts not just suburban buyers, but city dwellers, including the poor, who are faced with higher taxes, rents and the threat of non-market based gentrification. Governments have relied on planning advice insufficiently cognizant of economic consequences. The planners have sought to control the organic expansion of cities, pejoratively called “urban sprawl” (Note 2) no matter what the economic and social costs. Some suggest “intensification” --- redeveloping neighborhoods with higher densities, especially with apartments and high rises. The prospects are anything but encouraging. Intensification is likely to have little effect on affordability since the “floor” of urban land values is controlled by properties bordering the inside of the UGB (Figure). At most, only modest value reductions would be likely from subdividing existing lots (Note 2). At the same time not all housing is the same. Researchers at Toronto’s Ryerson University attributed house price increases, at least in part, to a mismatch between the single-family ground-oriented housing that households prefer and the higher density houses planning regulations require. Houses are not commodities --- households have specific and varying tastes. And, many will resist being socially engineered into the smaller houses the planners want. Finally, wholesale redevelopment could energize neighborhood opposition, as led to defeating an intensification proposal in California this year. Severely unaffordable housing in these markets is not new. By 2009, price-to-income ratios (median house prices divided by median household incomes, a metric called the “Median Multiple”) had at least doubled from before urban containment had been adopted in Vancouver, Sydney, Auckland and Melbourne. The “flood” of Chinese buyers came later. Toronto’s housing affordability crisis also came later, with a dizzying increase as house prices rose 100 percent relative to household incomes over little more than a decade. The results are a classic case of failed public policy. Housing costs have risen so much that households have much higher housing costs, which lowers standards of living. For some, housing costs have risen so much that they have been forced into poverty. California, despite its enormous wealth, with its urban containment policies, has the highest housing cost adjusted poverty rate among the 50 states, worse even than Mississippi (which has a reputation for the worst poverty in the United States). Many in younger generations, such as the Millennials, are likely to have a lower standard of living than their parents or even their grandparents. Had these consequences been subject to public debate in an election, urban containment would not likely have been implemented. The biggest problem, however, is that here is a very real threat to the future of middle-income households, which represent an economic advance centuries in development and too valuable to allow to fritter away. Are the Chinese to Blame? No --- blaming Chinese buyers is a diversion. Buyers seeking profits are not to blame, whether Chinese, Russians, other foreigners, or other domestic or local buyers. The fault lies with the governments that virtually invited investors seeking huge profits. The globalization of real estate markets by the internet just makes things worse. Each of these cities has made itself an investment target. The imperative is to remove the appeal to such unwanted speculation. Once the financial returns on housing return to normal levels, investors will switch to other housing markets or seek other investments entirely. Will Montreal be the Next Target of Foreign Buyers? Other cities are at risk. For example, new Montreal mayor Valerie Plante was so (rightly) concerned that she sought provincial approval for a foreign buyers tax. With a shortage of developable land due to urban containment, housing affordability is deteriorating in metropolitan Montreal (See: “Canada’s Middle-Income Housing Affordability Crisis”). Given all this, efforts to shield local residents from the horrendous house cost escalation are laudable. But more is needed than headlines --- results are needed. In Vancouver and Toronto, foreign buyers taxes had some positive impact in the most expensive sector (detached houses). But prices in the middle of the market continued to race well ahead of incomes. The crisis is in the middle of the market and even worse below. So long as there are UGBs, prices can be expected to rise faster than incomes and material improvement in housing affordability is unlikely. Importantly, removing UGBs does not require allowing the wasteful strictures mandating only extremely low density development documented in the Boston suburbs by Edward Glaeser, Jenny Shuetz and Bruce Ward at Harvard University. They found that 85 percent of land land was zoned for 2 houses per acre or less (5 per hectare) and in some communities average lot sizes were 1.5 acres (0.6 hectares). Of course, the cities should have considered the economic folly of urban containment before “jumping over the cliff.” But things are likely to only get even worse until UGBs are removed. The misguided policy priorities need to be corrected. People --- their standard of living and lower rates of poverty --- are more important than the urban form. There is hope. In one of the five cities, the necessary reform has been proposed by a government with the mandate to do so. New Zealand’s recently elected Labour government has promised to remove Auckland’s UGB. The others cities should follow. So long as these markets are rigged by UGBs, investors seeking high, virtually riskless financial returns will drive out those, particularly middle-income and lower middle-income households looking for homes. Note 1: As used in this article, “city” refers to metropolitan areas, which are also labor and housing markets. The city land use policies are those in effect in the cities, regardless of the enacting level of government. Note 2: The term “pejoratively” is used because urban sprawl remains ill-defined and has been refered to by planners to apply to everything from the densest urban areas in the world to the least dense. See “Focusing on People, Not Sprawl”). Note 3: Economists Edward Glaeser and Joseph Gyourko find that “land is worth far more when it sits under a new home than when it extends the lot of an existing home.”This suggests that the land values for new units on subdivided former single-family lots could rival the previous value of the lot. This does not consider the fact that land values in the already developed area are likely to dwarf those of parcels bordering the inside of the UGB.